It's safe to say that Vancouver has won my heart. This coastal city is one of a kind, so here's a snippet of what I love about living in Vancouver. One of my favourite things about Vancouver is the endless opportunity for adventure. It's easy to get lost in nature just a stone's throw away from the city. You can spend the morning skiing, the afternoon scuba diving or hiking, and the evening paddle boarding around English Bay for sunset. It's truly beautiful. If there's one thing Vancouver masters, it's brunch. Think eggs benny, avocado toast, and bottomless Mimosas. My favourite spot is Medina Café, where you'll find a creative selection of Mediterranean-inspired cuisine, as well as the city's best Belgian waffles. Vancouver's snow-capped mountains are what give the city its charm. With three amazing ski resorts located a short drive from Downtown, world-famous Whistler Blackcomb situated 1h 45 north of the city, and a number of summits, glacier lakes, and beautiful views in between, you're truly spoilt for choice when it comes to mountain exploration. I've spent the majority of my life in England where the winters are cold and rainy, and the summers aren't much better. The nice thing about Vancouver is that we have clear and consistent seasons. Summer sees temperatures in the high 20s (°C), and although the winters are fairly rainy in the city, this only means snow up in the mountains. While Vancouver's selection of clothes stores could be better, the home décor stores are absolutely dreamy. My favourite pick at the moment is Emfurn, a Canadian furniture company with warehouses in Richmond and across the US. They have many gorgeous mid-century designs that are surprisingly affordable, which only ignites my interior design obsession even more! I love the positive and vibrant energy that encompasses the city. From people, to interests, to hobbies, to scenery, to wildlife, Vancouver embraces diversity and caters to every being. Compared to the likes of NYC and London, Downtown Vancouver is pocket-sized. But the nice thing is that you can make your way around the city on foot. You're never far from the water and it's always beautiful being able to see the mountains peeking through the towering skyscrapers. Cheap isn't usually a word I'd associate with Vancouver, but when it comes to sushi, that's exactly what it is. There's no shortage of amazing sushi restaurants, many of which are super affordable and completely fresh. Daily sushi it is! 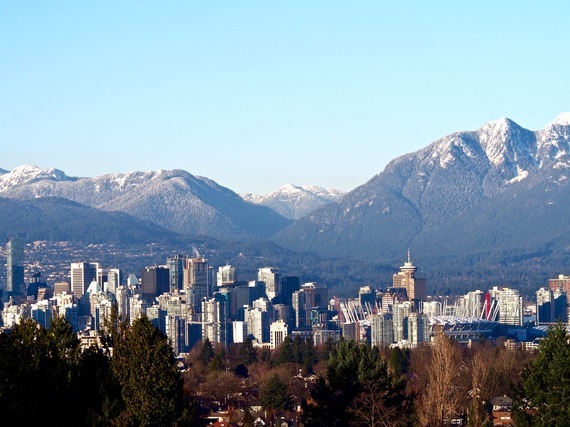 Located just steps from the city, Stanley Park is one of Vancouver's best assets. If you want to escape the hustle and bustle of the city, you don't have to travel far. Venture into the forest and you'll soon feel like you're in the middle of the wild, which makes it the perfect place for running, cycling, and wildlife spotting. One of the things I love most about Vancouver is being able to watch the sun set into the ocean. There are a number of lovely beaches in and around the city, and if you're lucky, you may even spot the odd whale or orca pod frequenting the waters. If that's not special, I don't know what is. Vancouver may not be for everyone, but for me, it's my favourite city in the world. Read more about life in Vancouver at www.golivexplore.com.